Best known for their Red vs Blue series, a satirical war narrative based on the Halo video games, the Rooster Teeth team also spent much of 2009 branching out into the world of live-action sketch comedy. And, it must be said, with no small measure of success. 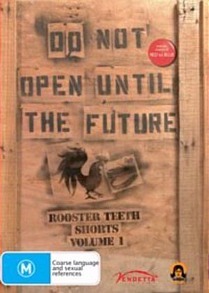 The end result is Do Not Open Until the Future, a 90-minute compilation of all twenty episodes from the first season. The release takes its name from the opening sketch, in which a bumbling pair of Rooster Teeth employees attempt to cryogenically freeze one of their voice actors. The plan is to thaw him out several decades later and get rich. ‘When you get to the future,’ advises one of the dimwits, ‘tell me to buy stock in Microsoft, Google, and whoever makes emails.’ ‘That’s not how time travel works,’ implores the hapless staffer, ‘you have to send me back in time.’ Undeterred, the duo pile on more ice before sealing their shivering victim in a crate bearing the eponymous sentiment. It’s a great sketch, and amply sets the tone for what’s to come. The shorts mostly revolve around Rooster Teeth headquarters, with staff, actors, friends and guests playing highly exaggerated (and occasionally downright maniacal) versions of themselves. The team have been around long enough to nimbly traverse the boundary between clever in-jokes and crass self-reference, and the sketches repeatedly hit their mark with well-timed punchlines and believable, if wilfully unpolished, performances. There are certainly similarities between Robot Chicken and the creative output of the Rooster Teeth team. The same ‘by nerds, for nerds’ aesthetic is evident, as is the encyclopaedic knowledge of popular and gaming culture, but there’s an recurring undercurrent of whimsy that seems to have been lost in later seasons of the Seth Green creation. It’s whimsy done through a sardonic, deformed and often bizarre filter, but it engenders a welcome levity nonetheless. The success rate is also higher than on Robot Chicken and its ilk, the humour broader and more accessible. A notable example occurs early on when one RT member steals another’s beard, piece by piece. It’s a complex and perfectly executed sight gag, and the way it plays out, as well as the accompanying looks of shock, are guaranteed to have you rolling in the aisles. To be honest I wasn’t expecting too much from the present offering, partly because I only knew the Rooster Teeth production team for their ‘machinima skits’ and partly because sketch comedy programs have been so hit and miss over the past few years. Well, I’m happy to stand corrected: Do Not Open Until the Future is fantastic. It’s one of the most clever, original and downright hilarious comedic creations in ages, and the resultant world of killer computers, eccentric characters and engaging, unpredictable premises is a thoroughly enjoyable place to be. The host of bonus features offer further incentive to first timers, and those who like their comedy with liberal doses of irreverence will not be disappointed by this accomplished and extremely funny release.